This interactive presentation contains the latest oil & gas production data from 12809 horizontal wells in the Permian (Texas & New Mexico) that started producing since 2009/2010, through September 2017. In this update we can see even more clearly how fast production has grown in 2017 so far in the Texas part of the Permian. Even though this data includes the data from pending leases (a Texas technicality), it is clear that production data from the June to August time-frame is still quite incomplete. Based on this month additions, I estimate that production for August will eventually turn out to be 100 (+- 50) kbo/d higher than shown here. While preliminary production for September is shown as well, I recommend to ignore it. I have deselected New Mexico, as it is even more incomplete than the Texas data for recent months. To see it, you can use the basin selection. In the “Well quality” tab, the production profiles are shown for all these wells. In the bottom graph you can see that since 2011 these curves have significantly improved every year until 2016. The wells that started production this year are on average quite closely tracking those of last year. If you switch product to “gas”, you can see that the same holds for natural gas production, although now the 2017 wells are a bit ahead again. In the “Well status” tab you can see the number of wells that were put online each month. In May this number was very similar as the high seen in 2014. This graph also indicates that data for later months is rather incomplete. In the last tab we can find the output of the top 5 producers in this region. Pioneer Natural Resources is clearly in the lead, while it was at the bottom of this list just over 3 years ago. This “Ultimate recovery” overview shows the average production rate for these wells, while they are heading towards their ultimate recovery. 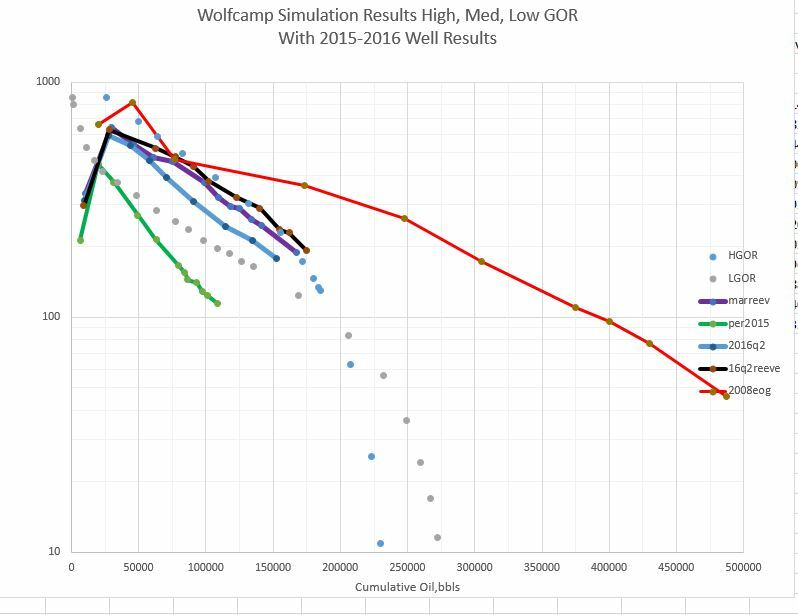 As recent wells are so much better performing than older ones, there is less guidance on how they will decline over time than we’ve seen in the other basins. If you change to gas here, you’ll see that these wells also appear on track to produce a significant amount of natural gas (I estimate > 1 Bcf on average for newer wells). The 9th tab (“Gas oil ratio”) shows how the gas oil ratio has generally increased with age for individual wells. The blue curve in the bottom graph reveals this ratio averaged over all wells, and that it hasn’t changed much over the past 2 years. On Thursday I plan to have a post on the Eagle Ford, followed by one on all the 10 states by the middle of next week. Production data is subject to revisions. Where wolfcamp simulations were conducted for a 7,000′ horizontal well for a low, middle and high GOR case. Twenty three frac stages with 4 perf clusters spaced 100′ per stage. 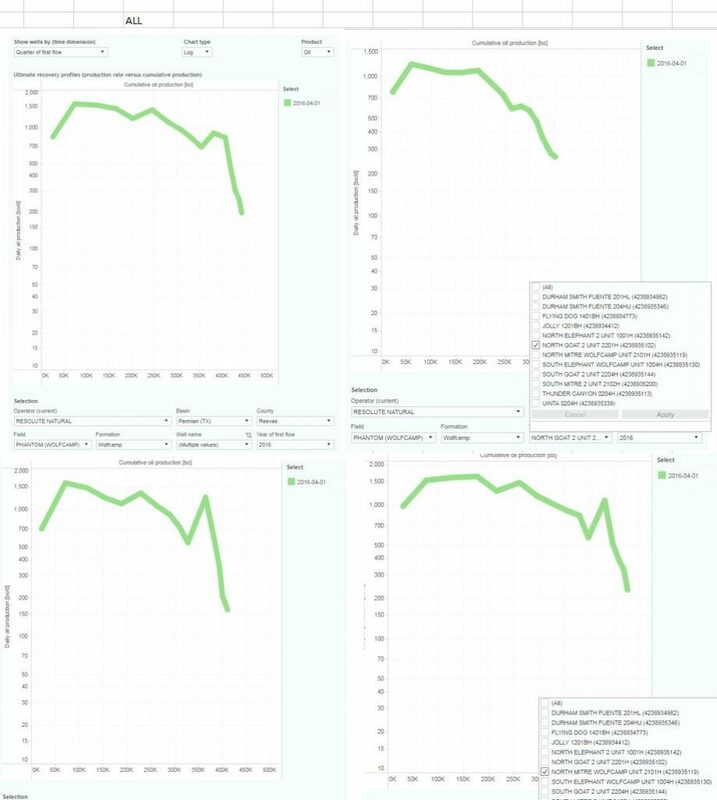 Oil performance results were screen digitized from this work and the low and high GOR cases are presented on an Enno Ultimate Recovery Graph as the discrete dots below. Overlain on this are Enno’s 2015 Permian wells, the 2016 q2 permian wells, the Martin and Reeves county wells, and the Reeves County wells. It appears that performance has not improved much since 2016 q2. Also for comparative purposes are EOGs 2008 Bakken Wells. The simulator appears to do an excellent job of matching behavior and it leads one to question if a 300,000 barrel average is attainable. This is rather remarkable, Jim; thanks a bunch. Particularly remarkable given $8M well costs. If hedged prices are $50-52 and net back is $24 it’s taking 334K BO just to get to payout. Thanks. Seems to be one of those deals where by the time we know the answer it will be too late. Showed this to a young man at dinner the other night he’s like “why aren’t analysts onto this?”. Told him nobody has ever been here before. Hard to tell how cold the water is in the pool looking at it. Without Enno’s work, we wouldn’t know where to start. Thanks for this update Jim! It looks to me like we need just a couple of months more data to confirm whether these wells start so slope concave downwards. Your individual well results are indeed interesting if one looks at the 3 wells completed by Resolute in Reeves county in the 2nd quarter of 2016. These are a group of wells that it would be difficult to better in my limited research. Recent performance of these wells might be negatively influenced by development or operational activity (if so it has persisted for 4 months). However, they do make one wonder about the future concavity of these completions. Indeed I would be a bit cautious using only the last couple of months data for a small number of wells, but you may be on to something. I would agree (maybe 6 months) and say a lot of the next 10 years of the world oil industry hinges on it! Is the dropoff in wells completed (first flow wells) in the July to Sept 2017 period for the Eagle Ford and Permian basin real or is this just a matter of incomplete data? Data in chart below is pulled from your September posts on Permian and Eagle Ford. Horizontal completions only (I think). 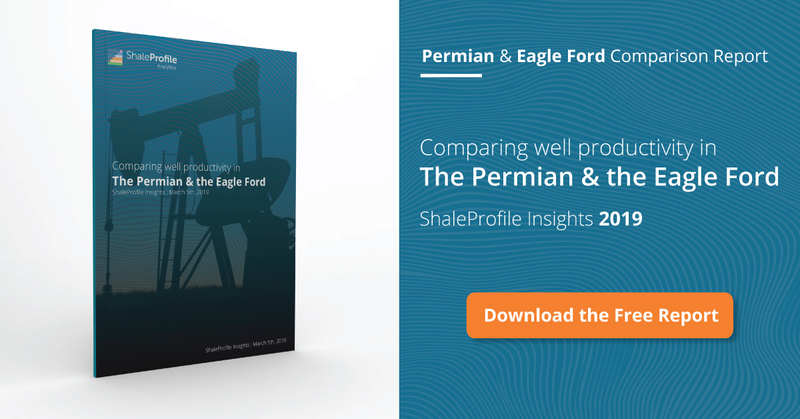 I looked back at earlier posts for the Permian and Eagle Ford. It looks like the most recent 3 months of “first flow” data is incomplete when the posts from 4 months ago are compared with the most recent posts for the Permian and Eagle Ford. Could you confirm this as you have seen a lot more of this data than I have and know how it is all put together? Indeed well and production data for Texas is rather incomplete for recent months (as published by the RRC). You can indeed get a feeling for that if you compare older posts with more recent data. The causes behind this are mostly unknown to me, but at least one major factor is that recent completed wells, and their production, are often reported late. I have the impression that the level of incompleteness has increased in the past few months. I only publish data on horizontal wells. First of all, thanks for your great website! I’m running out of superlatives to describe how superb it is. There is only one thing that bothers me. In Texas data, there seem to be way too much wells producing zero barrels for the latest month. Would it be possible to filter those out? The extra zero barrel wells are distorting several plots. I agree with your assessment. The problem is that not all leases have production reported for the last month in Texas. As it is available for most leases, I still want to show that month. The solution I use now is that I set production to 0 for the wells on these leases with no reported production, but that indeed leads to several distortions (as the underlying reason appears to be related to a delay in processing of the actual production numbers). I will have a look at this.